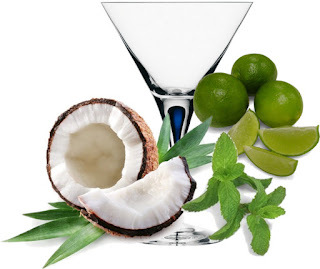 THE MARTINI CHRONICLES: Martini Thursdays...Coconut Mojito Martini! Greetings Divas and Gents! The weekend is almost here, and I am excited that it's a long one! For those of you hosting Memorial Day festivities, I wanted to share a cool and delicious martini recipe that is sure to entertain your guests. The Coconut Mojito Martini is the perfect combination of cool mint and exotic coconut. It's easy to make, and is the perfect way to usher in the summer season. Try it out and let me know what you think. Enjoy! 1. In a martini shaker, muddle mint leaves, lime juice, and sugar for about 2 minutes. 2. Add coconut rum and ice. Shake! 3. Strain mixture into a chilled martini glass. 4. Garnish with lime and mint leaves. Your guests will thank you! Enjoy the Coconut Mojito Martini. Be safe this weekend and Drink Responsibly! I'm going to add Rum to my bar for the summer. Great! Rum should be a staple in your bar!